Well, aye, Looks like some ofthe Dam**s are bursting forth – trying to keep theswamps alive despite Donal John’s efforts. Aye a Gran’ Hielan Laddie trying to do well for the world. It is hard graft – hope your reading this 🙂 Best wishes from Mother’s neighbours. 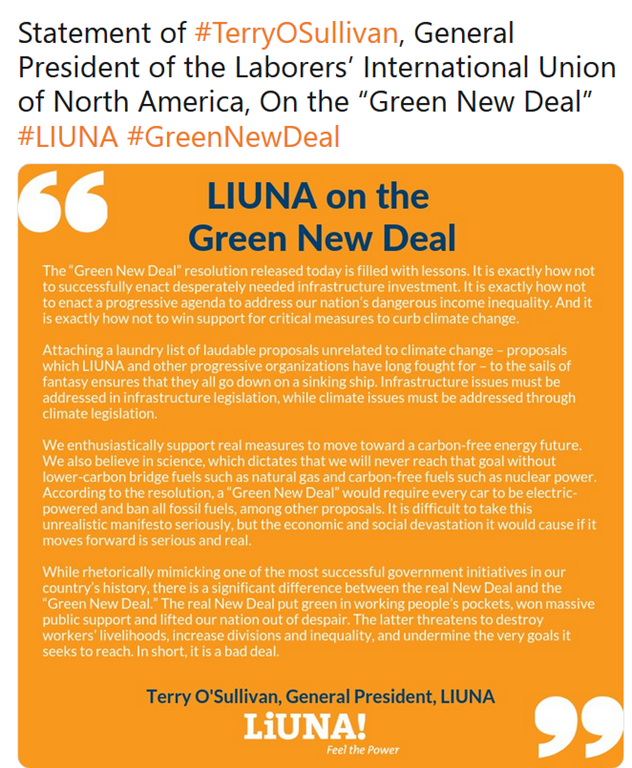 AOC and her gaggle are sheer “lunacy” and now the “Li-una-tics” of the unions are beginning to get the picture. So we have a traditionally old group of Marxists at the throat of a new group of Marxists. Yes at least the old version were a bit more realistic, this new lot are air heads without a clue of how the world actually works. Some of the UK unions have warned against driving away jobs by pursuing the green lunacy. Admittedly, they are probably focused on the loss of members paying their subs to keep the union barons in a life of luxury than anything else. The old version is pro-development, the new version is anti-development. You should rather side with someone who wants to keep the industrial economy running, even if you disagree on the particulars of how to run it best, over someone who just wants to destroy it all to save pristine nature. Sadly in the UK we don’t have a single union that is prepared to call out the green c**p, yes they do sometimes lament lost jobs, but only as a way to get something for the newly unemployed, and because that is what the now largely redundant unions are supposed to do. Remember, you don’t need crazy greens in govt to destroy a country, all you need is the threat that they might get into govt, investors will then flee elsewhere. They seem to be denying she ever said that. Are you going to believe me or your lying eyes? There is still the Wayback Machine. 404s magically reincarnated.